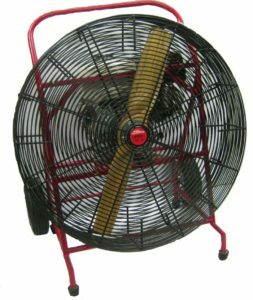 Our Hot Air Balloon Inflation Fans feature a sturdy powder coated steel frame with vibration dampers so the unit stays put. Wheels are standard for increased mobility. Our new free-air flow guard design allows air to be pulled in from the sides of the fan, resulting in more airflow production than other types of fans. The high performance wood propeller made of aircraft grade laminated maple is designed for maximum C.F.M. and safety. Heavy duty vinyl coated fan guard is designed for maximum airflow and durability. Powered by Honda 9.0 HP motor. The throttle, choke and on- off switch are conveniently located on the front of the unit, our units have automatic oil-alert and tip switch. It also has automatic decompression for fast and easy starting. Our balloon Fan frames have a 1 year warranty. All of our props 20″, 24″, and 30″ have a lifetime limited warranty against de-lamination. Models without wheels are available but only when specified by the customer.